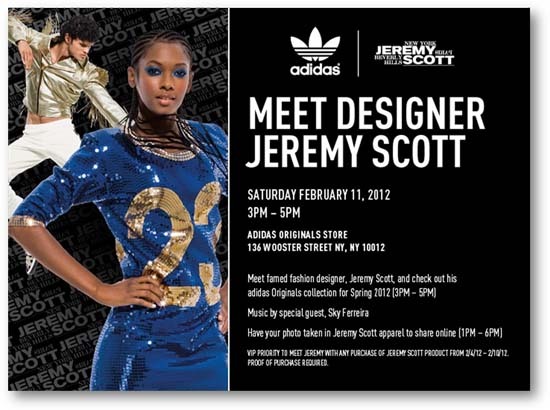 NEW YORK, Feb 8, 2012/ — adidas Originals will be holding an in-store event with Jeremy Scott this Saturday, February 11th at the adidas Originals store in NYC. Guests are invited to meet the famed fashion designer and check out his adidas Originals collection for spring 2012 from 3 – 5 PM. Music will be provided by special guest Sky Ferreira and guests will have the opportunity to have a photo taken in Jeremy Scott apparel from 1 – 6 PM to share online.